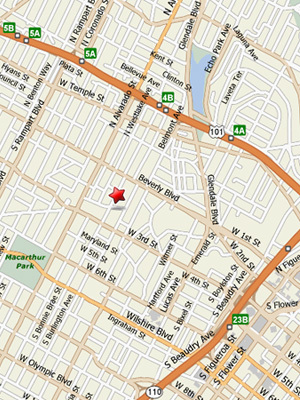 208 S. Bonnie Brae St.
North: (via Pasadena Fwy / SR-110) Take ramp right for 6th St / 4th St toward 3rd St. Turn left onto S Beaudry Ave. Turn right onto W 3rd St. Turn right onto S Bonnie Brae St.
West: (via Santa Monica Fwy E / I-10) Take ramp left and follow signs for SR-110 / Pasadena Fwy North. At exit 22B, take ramp right and follow signs for W 3rd St. Keep left to stay on W 3rd St. Turn right onto S Bonnie Brae St.
For additional information, contact our sales office.